Moscow, Russia. On November 22–24, 2017 All-over-IP celebrated its 10th anniversary to let the global and local digital community better embrace a new round of technology revolution. This year's show was sponsored by AxxonSoft, Basler AG, dormakaba, Dahua Technology, Intra, Speech Technology Centre, and partnered with Russian Biometric Society. In 2008, All-over-IP was established to highlight the technology regeneration of security and video surveillance. Back in those days the trend of transition from analogue to IP was expected to continue for around 5 years. A total of twice the five years has passed ever since; one evolution stage has followed another; the number of devices connected to networks to manage security, cities, industrial operations, transportation, product distribution has become huge; the market has been flooded with hunderds of new players. All-over-IP 2017 has resonated with the current IP industry's thinking and buoyant mood. The show revealed no signs that vendors, system integrators, installation contractors and end-user organizations felt any tired entering a new decade. It is the first time this year that exhibitors and visitors got a chance to collaborate for 3 days. The number of exhibitors reached 121. The IP industry is booming; vendors and solution providers are offered a whole world of new opportunities, and end-users are faced with challenging investment decisions to make. Why challenging? The dramatic technology change multiplied by potential versions of the future where the IoT transforms our lives implies various management choices. All-over-IP 2017 created an environment where businesses could sense and source the right approach to technology investments as well as understand how they could best get their companies into shape for the digital economy, and what they should work on now to succeed in years to come. The new conference agenda and new technology on display drove audience growth. Of the show's 4496 attendees (up from 3866 in 2016) over the three days, new visitors accounted for 66%. 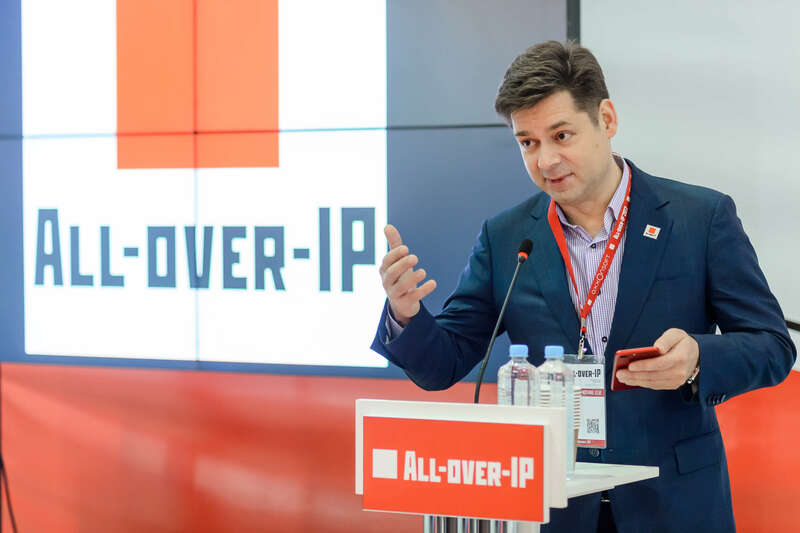 Andrey Miroshkin, CEO of Groteck Business Media, remarked: "All-over-IP 2017 showed a higher innovation level of technology on display, a higher need for education and expertise, and a major shift in distribution. Our exhibitors believe there is little room left on the market for companies that simply resell hardware or software. Nowadays, the local channel just cannot exist if they don't add value, differentiate and improve their expertise in technology and applications, meaning if they don't go deeper into end-user specifics and create vertical solutions." Professional expertise is on the rise! The market engagement in the conference part at All-over-IP has increased as business leaders and senior experts do not limit themselves to sharing future vision and technology insights, but also share guidelines for what has to be done to get a good return on investments in technology in short order. In 2017, the need for professional expertise has set a record for the last 10 years. The number of conference visitors reached 1030 professionals (up by 30,7% compared to 2016). Olga Fedoseeva, All-over-IP Program Director: "The intellectual potential of show exhibitors and speakers allows for setting a technology and business agenda for the whole high-tech industry in Russia and adjacent territories. Based on discussions, presentations and interviews from All-over-IP 2017, we are going to map out the future, and unveil technology and business roadmaps to guide brands, the channel and end-customers' to success." Book All-over-IP 2018 until December 25 to secure 2017 prices and get a 10% discount on stands, seminars and sponsorship packages. Please, claim 2017 prices here: https://www.all-over-ip.ru/book-now-2018 or contact Alla Aldushina (aldushina@groteck.ru) and Olga Fedoseeva (fedoseeva@groteck.ru).